The next Canterbury Rare Breeds Auction and Heritage Lifestyle Day will be held at Willowbank Wildlife Reserve, 60 Hussey Road, Christchurch, on Sunday 8 March 2020. Entries will be accepted from early January. Date for close of entries is 20 February. No late entries will be accepted, nor can changes or substitutions be made after that date. All intending purchasers must register prior to the start of the auction on the day. Viewing from 10.00 a.m., Auction starts 12.00 noon. We will again be having a used goods sale of donated items at the Rare Breeds Auction. Bring and buy anything pertaining to birds or animals, e.g. saddles, horse covers, cages, incubators, halters, stock feed, etc. etc. No chemicals please. Items valued at $50 or more can also be offered for sale 'on behalf' for a 25% commission which goes to the Rare Breeds Society. Although not essential it would help if you could let us know beforehand what you are bringing – e-mail canterbury(at)rarebreeds.co.nz or phone (03) 318 7237.
canterbury(at)rarebreeds.co.nz or phone (03) 318 7237 if you're interested. 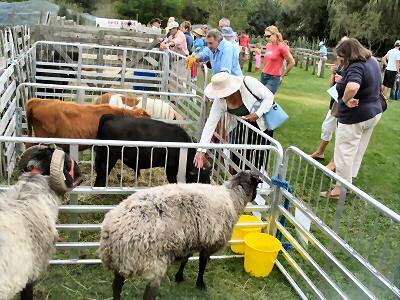 (a) One starting at 12 noon for larger livestock (sheep, goats, cattle, etc.). (b) The other starting at 1.00 p.m. for poultry (chooks, ducks, turkeys, rabbits etc.). (a) Sheep, goats, pigs, cattle, deer, horses, donkeys, camelids, ratites: $5 for each animal. No more than four birds may be entered in any one Lot. The number of roosters entered must not exceed the number of hens entered per vendor. The description of stock for sale is as supplied by the Vendors, and they are responsible for its accuracy. To enable the Catalogue to be produced all entries must be received no later than two weeks before Auction day; no late entries or changes can be accepted. Only recognized breeds may be entered. Once an entry has been confirmed no variations may be substituted. Substitute entries will be rejected from the Auction. Any bird or animal that does not pass health inspection will be rejected from the sale or display. The Auction Organizers reserve the right to restrict the number of entries in each section. Vendors will receive a Confirmation of Entry and Lot numbers by mail or e-mail. Bidding on poultry will be per Lot and buyers must take and pay for all the birds in the Lot. Bidding on large animals will be per animal. Display sites will be available for promoting rare breed livestock/poultry and associated commodities at a cost of $25 for ten square metres. All poultry and livestock must be penned by 10.00 a.m. on the day of the Auction. Entrance gates on Hussey Road will open for Vendors at 8.30 a.m. – Vendors must bring their Confirmation of Entry with them. It is the responsibility of Vendors to ensure that their stock are fed and watered throughout the day, and they should note that animal welfare ethics apply. Vendors who do not observe this condition may be refused entry in succeeding years. If there are any formal ownership transfers, they are the responsibility of the Vendor. Ten percent (10%) commission on the sale price will be charged on all sales. Names and locations of Vendors will be published in the Catalogue. Buyers must pay for and collect all Lots for which they have successfully bid. Any unsold stock and all stock purchased must be uplifted before 6.00 p.m. on the day of the Auction, unless special arrangements have been made with the Organizers of the Auction beforehand. Buyers must supply their own containers, appropriate to the welfare of the animals, for collecting and transporting them. Any non-compliance with these terms and conditions may result in stock being rejected from sale. Admission to the Auction between 10.00 a.m. and 1.00 p.m. is $10 per adult, $5 per child between five and fifteen years old, children under five free. (This includes free entry into Willowbank Wildlife Reserve.) Each vendor will be issued with one free Pass. The Catalogue will be available on Auction day for a donation of not less than two dollars ($2). Fees, Commission, Admission charges, Catalogue donations and any other income generated will be used to cover expenses, with any surplus going to the Canterbury Section of the Rare Breeds Conservation Society of New Zealand Incorporated and Willowbank Wildlife Reserve. The Display Entry Form needs to be printed and posted to the address given, either accompanied by a cheque or the fee transferred and referenced with the same name as on the form. display on noticeboards in shops, vets etc. Terms and Conditions as an A4 sheet. The Rare Breeds Conservation Society is a volunteer organization. We thank you for your support and co-operation. Back to first Auction page.